If you're a ski mountaineer or an adventure racer seeking the lightest possible gear, meet your new crampon: CAMP USA's 390-gram XLC 390. The Camp XLC 390 weighs in at an astonishingly light 13 ounces per pair, including a fully automatic binding. In terms of weight, at least, the nearest competition doesn't even come close. The XLC achieves its best-of weight reduction by being composed almost entirely of aluminum—including (I believe) the front & rear bail wires. That should certainly give you pause when it comes to assessing the XLC's ultimate durability. But does it matter? 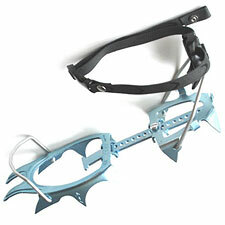 You're not going to be using these for technical rock, ice, or mixed climbing. For most skiers, crampons will often stay in the pack the entire time as insurance. When you do want the XLC 390, it will be to cross steep, hard snowfields—not climb waterfall ice. For ski mountaineering and adventure racing applications, the XLC 390 therefore excells in the only category that really matters: weight. What really makes the Camp 390 a surprise, then, is its excellent all-around performance. The XLC 390 grabs the snow with authority, especially if you like to keep your feet flat across the hill, rather than front-pointing up. The extra two points allow the 390 to use shorter points overall (for enhanced durability) without the usual sacrifice in grip. I was also greatly impressed with the XLC 390's automatic binding. Straps are fine, of course, and offer the most versatility when it comes to fitting a wide range of boots. But if you're wearing a lugged ski or mountaineering boot, the convenience of an automatic binding really can't be beat. It's hard to imagine such a light, all-aluminum crampon will hold up to regular, heavy use for all but the most cautious (and light) climbers. While I am a light climber myself (140lbs), I've put in more than enough time over multiple seasons to say the XLC 390 has held up beyond my expectations. It has proven surprisingly sturdy and durable. Be aware that you can bend the crampon teeth if you're scrambling on rock—but realistically, these aren't designed for that. On snow, the XLC 390's blend of light weight and performance is unmatched.